LINE FRIENDS, one of the world's fastest growing global character brands, has announced that it will launch 'Bang & Olufsen X LINE FRIENDS Beoplay P2 BROWN Limited Edition' (Beoplay P2 BROWN) globally from October 4 in collaboration with renowned global audio and lifestyle brand Bang & Olufsen. This marks the very first collaboration with Bang & Olufsen, which is renowned for the cutting-edge acoustic innovation, and LINE FRIENDS, which has demonstrated unparalleled creative capabilities as a global character brand. In particular, the 'Beoplay P2 BROWN' is expected to win over the hearts of consumers owing to the fact that it marks the first-ever character collaboration from Bang & Olufsen. Another remarkable feature is that the 'Beoplay P2 BROWN' comes in brown by utilizing the design from the representative character of LINE FRIENDS, 'BROWN' which is widely loved by millennials from all around the world, while maintaining the strengths of existing Bang & Olufsen speakers. The 'Beoplay P2 BROWN', a truly personal and fully portable Bluetooth speaker, harmoniously blends the unique color of 'BROWN' with the pearl blasted, anodized aluminum grill top and smooth polymer bottom. A genuine leather strap, featuring the face of 'BROWN', adds an extra level of portability. 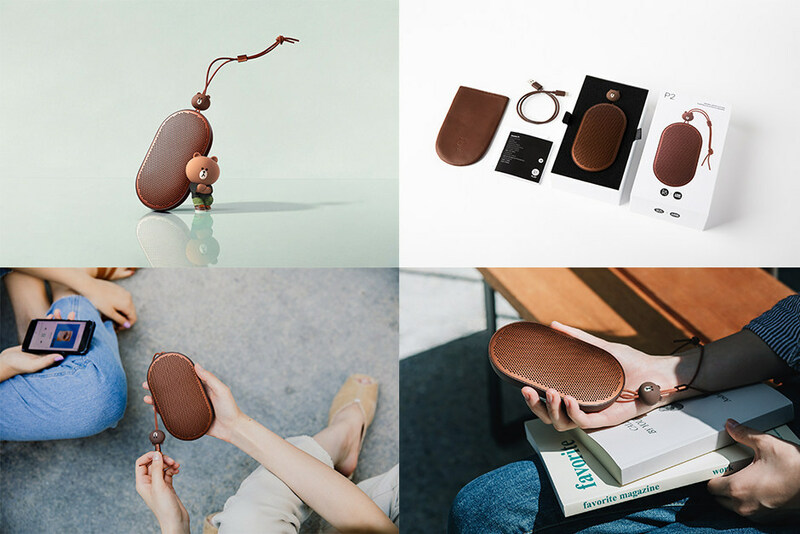 The speaker comes with a leather pouch and accessories customized with the same color, which will only be available for the 'Beoplay P2 BROWN'. With Bang & Olufsen Signature Sound, the speaker ensures a rich sound, outstanding for its size. It also offers high level of durability, being splash and dust resistant along with portability due to the light weight design, and up to 10-hour battery life. The 'Beoplay P2 BROWN' is expected to gain high popularity particularly from consumers who seek for both premium-level quality and individuality embedded with brand philosophy, technology and product design. This uniquely designed portable Bluetooth speaker will also gain attention from artists such as musicians and photographers, who are always looking for new inspirations in outdoor activities. "LINE FRIENDS has endeavored to offer new kinds of entertainment to consumers through series of collaborations with global premium brands that share a similar brand philosophy with ours. We're thrilled that LINE FRIENDS was able to collaborate with Bang & Olufsen and launch the first-ever character speaker and we hope that consumers around the globe will be able to enjoy the best-quality sound and design with the 'Beoplay P2 BROWN'", said LINE FRIENDS. The 'Beoplay P2 BROWN' will be available exclusively at LINE FRIENDS global offline stores and online channels in Korea, the United States, Japan, China, Taiwan and Hong Kong starting from October 4. The product details can be found at the brand page of LINE FRIENDS (https://www.linefriends.com/bangandolufsenbrown?lang=en). Meanwhile, LINE FRIENDS has collaborated with a number of premium brands from diverse industries and recorded sell-outs, such as a British premium bicycle brand 'Brompton', a Dutch design studio 'Mr. Maria', a French cosmetics brand 'L'Occitane' and a German premium writing instruments brand 'LAMY'.